Minister of Lands, Agriculture, water, climate and Rural Ressettlement Perrence Shiri. CHIREDZI - Some 213 farmers allocated plots on Tongaat Hullet plantations in Chiredzi in 2016 will be evicted and moved to virgin land, impeccable sources have told The Mirror. 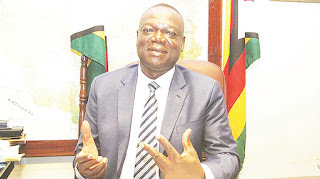 The sources said 200 farmers allocated plots measuring a total of 4000 hectares on Tongaat fields by the late Minister of State for Masvingo Shuvai Mahofa in Triangle and Hippo Valley are going to have their offer letters withdrawn and be moved to a new site called Kilimanjaro which Government has tasked Tongaat to develop. The Minister of Lands, Agriculture, water, climate and Rural Ressettlement Perrence Shiri could not be reached by the time of going to Press. The controversial seizure of Tongaat sugarcane estates by the State and subsequent parcelling out to the farmers created immense controversy that divided Zanu PF and left Tongaat and the farmers fighting battles in the courts. There are arguments that by seizing Tongaat estates Government was slowly destroying the company which is the largest employer in the Southern region and a key foreign currency spinner. The continued seizure of Tongaat land has also seriously affected its sugar production and is one of the reasons why the company had to buy cane. There have also been complaints that the new farmers had caused a sharp drop in production of sugarcane per hectare because of their poor farming methods. The quality of their cane is also said to be poor. "The Government has already taken a position and these farmers are going to be moved. This is a sensitive issue which cannot be discussed now," said the official. Tongaat Hulett Corporate Affairs and Communications Manager Adelaide Chikunguru said she was not aware of any new developments. She said that the matter was being handled by the Ministry of Agriculture.